Jerry Bradley is the author of several books including The Movement: British Poets of the 1950s and his acclaimed first volume of collected poems, Simple Versions of Disaster, which was commended by the Dictionary of Literary Biography. 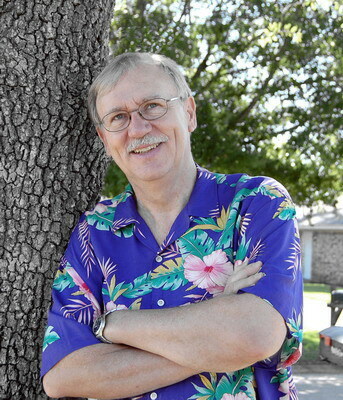 He is member of the Texas Institute of Letters and past president of the Conference of College Teachers of English (CCTE), the Texas Association of Creative Writing Teachers, and the Southwest/Texas Popular Culture Association. The current poetry editor ofConcho River Review, Bradley was founder and editor for sixteen years ofNew Mexico Humanities Review. He has served as a member of the literature panel for the Texas Commission on the Arts and the New Mexico Arts Division. Currently he is Professor of English at Lamar University. Among many awards Bradley has received during his teaching career are the CCTE Frances Hernandez Teacher-Scholar of the Year (2005), the Texas College English Association Joe D. Thomas Scholar-Teacher of the Year (2000), the Panhandle Professional Writers Unrhymed Poetry Winner (1998) and their Rhymed Poetry Winner (1997), the Boswell Poetry Prize (1996), the CCTE British Literature Award (1996), and three-time Pushcart Prize nominee. He was named Outstanding Alumnus at Midwestern State University, College of Liberal Arts (2002). Bradley is the author of more than one hundred fifty published stories and poems and has published more than thirty critical articles and eighty reviews. He has received more than forty grants in support of his literary activities. Bradley’s poetry has appeared in many literary magazines including the New England Review, American Literary Review, Modern Poetry Studies, Poetry Magazine, and Southern Humanities Review.